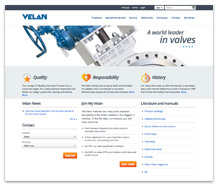 Velan is a world-leading multinational manufacturer of industrial valves. 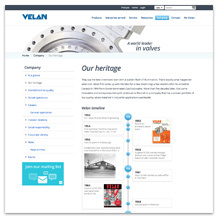 From humble beginnings in a Montreal garage in 1950, Velan has grown into a global company that has become synonymous with the highest quality of valve technology. HTC’s familiarity with the brand stems from producing promotional advertising and an annual report for the company in the 1990s. Revisiting the company’s marketing initiatives, it is clear that their website is no longer effectively communicating Velan’s leadership position, undermining the company’s tremendous brand equity. Velan’s former website could only be updated by a single staff member, curbing the online potential of the international, publicly-traded company. HTC needed to build a site that can accommodate multiple Administrators across multiple locations, with powerful functionality and top-level user-oriented design to provide the company with a website that can grow as they continue to expand. The new website was designed to highlight Velan’s impressive product catalogue and accompanying literature, present their extensive list of international sales and service contacts in a user-friendly front-end display, and build the online My Velan community with an emphasis on news, events and careers at the company. Plans to eventually expand the new bilingual site to offer multiple languages will benefit from the extensibility an IgnitionWeb system. The scope of the project required extensive customization. News & Events Manager was developed to handle news articles, event postings and registrations for logged-in My Velan Members. Promotions Manager allows Administrators to upload branding headers and banner elements to keep the site up-to-date with marketing initiatives. Contact Manager stores Sales, Service and Corporate contacts which users can easily filter by territory on the front-end, while Administrators can download spreadsheets listing the data on a per-contact or per-territory basis. Velan now has a top-of-the-line website that matches the reputation of their offering. Website administration is divided across a team of ten Administrators, according to their offline roles and responsibilities, ensuring timely and accurate content updates. 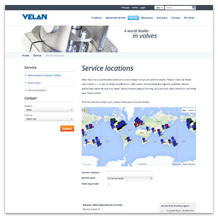 Velan catalogues, maintenance manuals and other important documentation can now be downloaded, emailed or requested in print through the front-end site. This has both reduced the overall volume of print requests (saving the company shipping and printing costs), while streamlining the work flow to process print requests online.